"I just found out that we have a new Supreme Court justice." I'm a sophomore in high school and I just found out that we have a new Supreme Court justice. This makes me think back on last month when I was leaving the gym. It was 8:30pm and I get a text from my mom that she's in the car waiting for me. So I'm walking out, and there's this man following me. I get really scared and it comes to the point where I have to start running because this man is so close. I got inside the car and my mom asks me , "Are you OK? Did something happen?" I didn't know how to respond in that moment but I thought: Maybe if society didn't have these norms that women are objects or that they can be assaulted and no consequences will happen to the men, I wouldn't have to feel this way. But I do. And it's a prevalent problem for women. I'm too young to vote and I don't have that power, but I do go out and I canvass and I register young voters. If you have the power to vote, please vote on my behalf. If you can promise to vote for me, that would be so great. 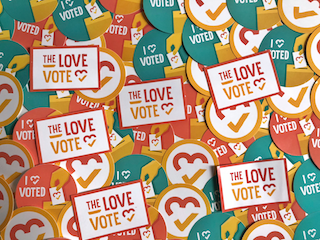 Show Montsy love + inspire others + get voting info + get event invites + get stickers + create change!